Black and white negative showing Donald Ross Beaton in his military uniform. He is standing in front of a fireplace with his hands crossed in front of him. Donald Ross Beaton was born 8 June 1920 in Whitby, Ontario to Blake Byron and Amy Winnifred (Ross) Beaton. 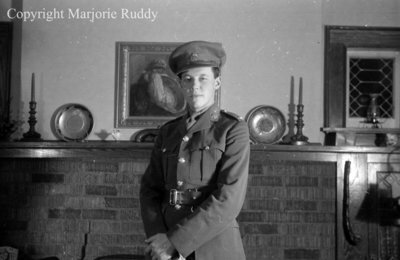 He enlisted in the Canadian Army at the beginning of World War Two and remained overseas until the end of the war. Upon his return he continued his military career as an Officer until his retirement in 1959. Major Beaton died on 22 November 1969 in Richmond, Virginia, U.S.A and is buried in Signal Hill Memorial Park, Hanover, Virginia, U.S.A.
Donald Beaton, November 22, 1939, Marjorie Ruddy. Whitby Archives A2013_040_816C.